Planning family menus can be challenging at the best of times, and cooks trying to cut costs and create healthy low cost meals face even bigger challenges. The key to creating well-balanced and frugal meals is to make the most of inexpensive ingredients, take the focus off the more costly items, and to use up leftovers in creative dishes. By planning meals for several days, you can coordinate your meals to save time and money. Bookmark this easy-to-use ten day menu plan of frugal family dinners to view on your laptop or tablet. 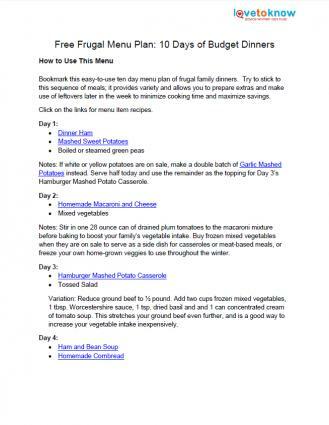 If you prefer, print out the menu plan and each recipe (click on the links for menu items) and keep them in a binder. Try to stick to this sequence of meals; it provides variety and allows you to prepare extras and make use of leftovers later in the week to minimize cooking time and maximize savings. Choose inexpensive ingredients for your main dish and reduce the amount of more costly ingredients to trim your meal costs. Beans are a cheap and nutritious main ingredient, and can be a good way to try recipes from other cultures. While canned beans are inexpensive and often go on sale, try dried beans to save even more money. Visit your bulk food store and stock up on kidney beans, black beans and navy beans to use in your new recipes. Eggs are another cheap and healthy ingredient to use in your frugal menu plan. Make an omelet or frittata and use up chopped vegetables, mushrooms, leftover pieces of ham, bacon, sausage, or other meat from earlier in the week. Sprinkle shredded cheese over your eggs, and serve with toast and a glass of milk for a cheap and healthy meal. One of the best ways to save money on your family menu is to coordinate your meals to use up all of your leftovers. 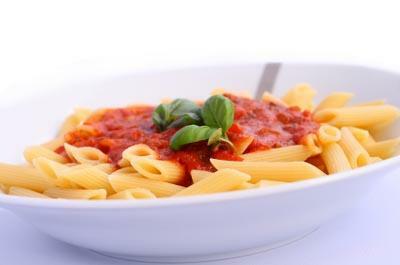 Save spoonfuls of vegetables, meat, poultry or pasta to use in hearty soups and stews. Plan to serve these at the end of the week. Casserole recipes are a great way to make a family-sized meal from one or two portions of more expensive cuts of meat or chicken. Add canned creamed soups, frozen vegetables, hash browns and shredded cheese to make a filling meal and cover all the food groups. Use up leftover rice in a ham or chicken casserole, and make use of stale bread or crackers as a topping for a bubbly pasta casserole. Canned tuna and salmon is a cheap way to feed your family fish. In addition to a simple meal of tuna sandwiches and soup, try a tuna casserole recipe or make patties to serve with rice and mixed vegetables. A tuna pasta salad with crusty homemade bread can make a filling and delicious meal. Tuna or salmon melts on toast with a mixed green salad is an inexpensive lunch or light summer dinner. Chicken: Buy a full chicken and stretch it into several meals like chicken noodle soup, chicken pot pie, chicken and rice casserole, chicken stir-fry with frozen vegetables and rice, and chicken wraps. Pot roast: Make pot roast with root vegetables, Yorkshire puddings and potatoes, beef stew with dumplings, and veggie beef soup with homemade bread or buns. Ground beef: Stretch your beef with oatmeal or breadcrumbs for meatloaf, or add tomatoes and spices for a big batch of spaghetti sauce. Canned soup: Use coupons and sale prices to stock up on cream of mushroom, cream of tomato, and cream of chicken soup for quick meals and as a casserole ingredient. Canned baked beans: Fast and easy. Serve it with whole grain toast, veggie sticks and a glass of milk or cheese slices for a wholesome and cheap meal. Boxed macaroni and cheese: A great frugal option to build a meal around. Add a can of tuna, chopped ham, chopped wieners, or 1/2 cup cooked ground beef, and 1/2 cup of peas for dinner. Pasta: Dried pasta keeps well and can be a filling and cheap side dish, main dish, soup ingredient, or an addition to a frugal casserole. Frozen fruits and vegetables: These are often as good as fresh produce, but can be much cheaper and help you avoid wasteful spoilage. Get familiar with the regular prices at your local supermarket so you will recognize a good sale price when you see one. Collect and use coupons - adding coupons to an item already on sale can double or even triple your savings. By researching prices, tracking sales, couponing, and planning your menu for several days at a time, you can save hundreds or even thousands of dollars on your family food bill.